The EU BIM Task Group aims at delivering greater value for public money, while stimulating innovation and growth in both the construction and digital sectors in the European Union. Finland is at the forefront of this paradigm shift, which can generate over €3 billion worth of savings per year in the country. 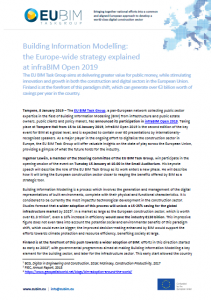 Tampere, 8 January 2019 – The EU BIM Task Group, a pan-European network collecting public sector expertise in the field of Building Information Modelling (BIM) from infrastructure and public estate owners, public clients and policy makers, has announced its participation in infraBIM Open 2019. Taking place at Tampere Hall from 15 to 16 January 2019, infraBIM Open 2019 is the second edition of the key event for BIM at a global level, and is expected to contain over 60 presentations by internationally-recognised speakers. As a major player in the ongoing effort to digitalise the construction sector in Europe, the EU BIM Task Group will offer valuable insights on the state of play across the European Union, providing a glimpse of what the future holds for the industry. Ingemar Lewén, a member of the Steering Committee of the EU BIM Task Group, will participate in the opening session of the event on Tuesday 15 January at 10.00 in the Small Auditorium. His keynote speech will describe the role of the EU BIM Task Group as its work enters a new phase. He will describe how it will bring the European construction sector closer to reaping the benefits offered by BIM as a strategic tool. Building Information Modelling is a process which involves the generation and management of the digital representations of built environments, complete with their physical and functional characteristics. It is considered to be currently the most impactful technological development in the construction sector. Studies forecast that a wider adoption of this process will unlock a 15-25% saving for the global infrastructure market by 2025. In a market as large as the European construction sector, which is worth over €1.3 trillion, even a 10% increase in efficiency would save the industry €130 billion. This impressive figure does not even take into account the potential social and environmental benefits of this paradigm shift, which could even be bigger; the improved decision-making enhanced by BIM would support the efforts towards climate protection and resource efficiency, benefiting society at large. Finland is at the forefront of this push towards a wider adoption of BIM: efforts in this direction started as early as 2002, with governmental programmes aimed at making Building Information Modelling a key element for the building sector, and later for the infrastructure sector. This early start allowed the country to accumulate precious knowledge and first-hand experience in the field. Several projects have already been completed, and more are in progress, confirming that a 10% increase in efficiency is perfectly attainable – and that there is room for improvement well beyond that threshold. Considering the yearly value of the construction industry in Finland, which amounted to €33.7 billion in 2017, a wide adoption of BIM could generate savings of over €3 billion per year. “There is a reason why the most important BIM forum worldwide for the infrastructure sector takes place in Finland: the country is a true pioneer in the adoption of Building Information Modelling. The entire Nordic region has embraced this technological development early on, with public clients fully understanding the business and environmental advantages it could generate”, says Ingemar Lewén. “Awareness of the importance of BIM is now widespread, not only in the Nordic region, but across all of Europe. In order to fully reap the benefits of this method, we now need to develop a strategy and an action plan for mobilising the Europe-wide digital transformation of the construction sector. This requires a concerted effort, in which both public clients and companies play a key role. It is first and foremost a cultural shift; a shift that Europe is ready to make”. Ingemar Lewén, who is a member of the Steering Committee of the EU BIM Task Group, acts as an Information Strategist with the responsibility for BIM at the Swedish Transport Administration (STA). He is Chair of the Nordic Road & Railroad BIM Collaboration. The EU BIM Task Group, a network supported by the European Commission, was founded in January 2016 and rapidly grew to include 23 countries in Europe. Through this platform, public estate owners, infrastructure operators, policy advisers and procurers throughout the entire continent can exchange best practices, stimulate co-innovation and draft strategies that will drive the construction sector towards a smarter, more efficient future. Learn more about the EU BIM Task Group on YouTube. Click here to download PDF version of this press release. Ingemar Lewén’s keynote speech will be part of the opening session of infraBIM Open 2019, taking place on Tuesday 15 January at 10.00 in the Small Auditorium at Tampere Hall, Tampere, Yliopistonkatu 55. If you are interested in setting up an interview on-site, please contact our press office.